This panel for Panic’s ‘Status Board‘ iPad app quickly shows you the status of Apple’s various services (iCloud, Services and Stores). 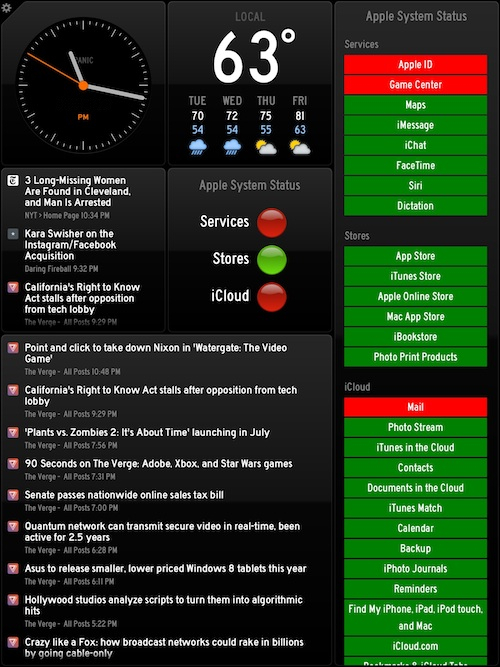 It’s very handy for checking at a glance if any of Apple’s cloud services are having issues. There are two versions of the panel: Summary and Detailed. The ‘Summary’ panel has one indicator for each of the 3 major services (Services, Stores & iCloud). The ‘Detailed’ panel has an indicator for each individual service.